Paper Napkins 2ply 33cm 2000 per case. 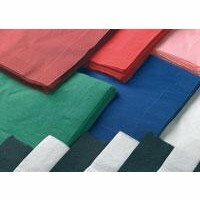 These napkins add complementary colour to any take-away outlet, bar or cafe. These napkins are great for the lining of baskets, wrapping cutlery. Janitorial Direct Limited also offer a highly efficient printing service, resulting in a high quality end product. All napkins and coasters are available for custom printing in one or two colours. Artwork can be created in house or alternatively existing artwork can be used. Pantone colour can be matched and printing on white or coloured napkins and coasters is available, with a minimum 10 carton order.